If you drive down Fairview by the airport, just past McLeans Auto Body, make a right at Freeman St. and follow the signs to Fed Ex. Keep driving past Fed Ex and you will drive right into these two historic hangars. They’re easily overlooked, but have sat here proudly since the early 1930’s, and were used continuously until recently. They came to our attention recently thanks to a news item, announcing their pending demolition. After doing some research, we found the article is misleading, and that the hangars in question are actually older than World War II. These are the genesis of today’s airport. The first airplane ever spotted flying over Goleta was a rickety flying machine flown by this man, Lincoln Beachey. Beachey was a world famous “Barnstormer”, a pioneer American aviator who got rich and famous from flying exhibitions where he performed aerial stunts. His accomplishments are many, including being the first person to fly an airplane over Niagara Falls, inventing figure eights and the vertical drop, racing a train, letting his wheels touch the top of a moving train as he passed above, and he set many aviation records. He did all these crazy things wearing a business suit and flying in a plane that was described as looking like “a beat-up orange crate.” He was performing at an Air Circus in Hope Ranch when he flew through the Goleta Valley as far as Ellwood Canyon, then returned to do a loop to loop and crashed into an oak tree at Laguna Blanca! He survived that crash, but died a year later when he crashed and drowned in the San Francisco Bay. The next planes to fly over Goleta were retired war planes, being used to spot forest fires. In 1920, a fleet of these planes set up a temporary airfield south of Hollister Avenue, between Storke and Los Carneros. The ground that close to the slough proved to be too soggy to make a functional landing strip, and the fragile planes were prone to flip when touching down. The site was soon abandoned. In 1928, Royce Stetson and Gordon Sackett landed an airplane in a cow pasture behind St. Raphael’s church, which at that time was on the corner of Hollister and Fairview Ave. They leased that land and set up a flight school right there. The aviators enlisted the help of some county employees to scrape away the willows and brush, creating a 3,000 foot air strip. That first airstrip marked the beginning of what was to become the Santa Barbara Municipal Airport. There was one other air strip in Santa Barbara at the time, operated by this man, Earl Ovington. It was near the Samarkand Hills and called the Casa Loma airfield, but it was regarded by many fliers as too dangerous to use. 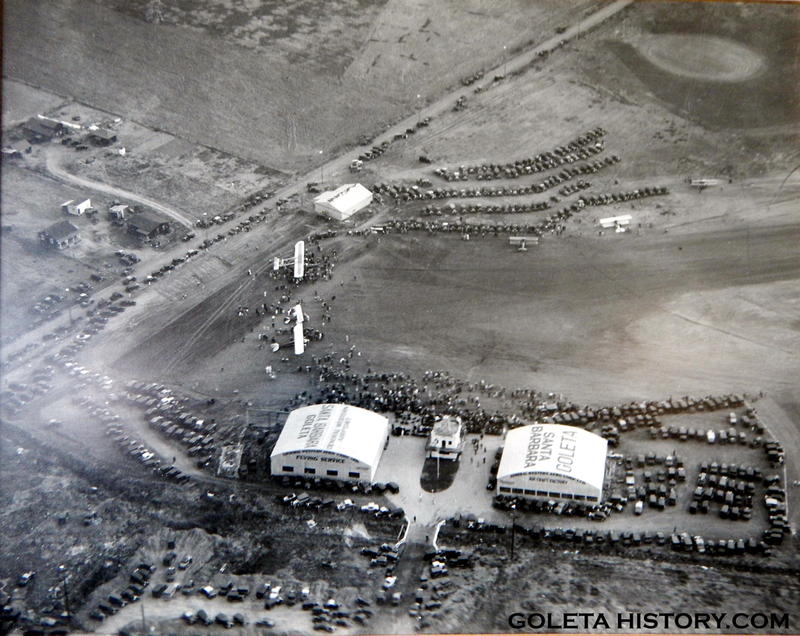 In 1930 a test pilot from the General Western Aircraft Corporation inspected the new Goleta Airfield and the company decided to move it’s factory from Burbank to Goleta. In 1931 the City Council voted to terminate Ovington’s permit to operate the airport at Samarkand, and Frederick Stearns built two hangars at the Goleta airfield. And there they sit, to this day. General Western began producing “Meteor” airplanes, reportedly the first plane to have a metal rather than wooden propeller. Several “Meteors” were built there, but General Western soon ran into financial problems, and in 1932 shut down. The photo above is the General Western workforce in late 1931, with one of the hangars and a small terminal in the background. Soon after the demise of General Western, Stearns took over operations. He added and paved more runways, installed radio equipment and established Santa Barbara Airways in 1932. The first passengers boarded planes from Pacific Seaboard Airlines. 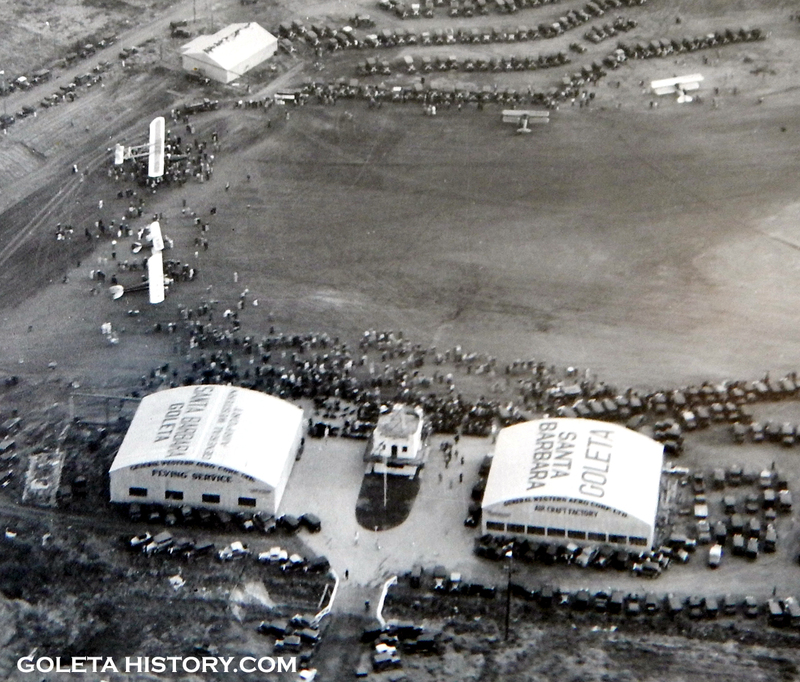 On October 1st, 1936, United Airlines started daily service into Santa Barbara, and more than 1,000 citizens were on hand to welcome the first ten passenger Boeing to land in Goleta. 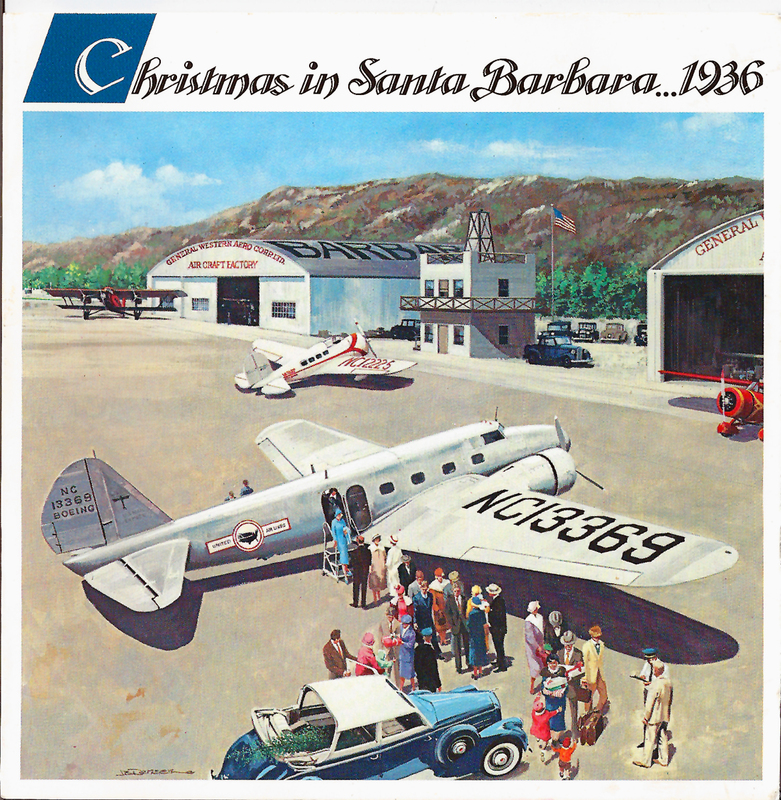 As air travel became more popular, so did the Santa Barbara airport. This great postcard from 1936 shows the two hangars in their heyday. It’s unclear exactly when the little terminal between the hangars was built, but it was demolished in the late seventies. In 1938 a nationwide campaign called National Air Mail Week was launched in an effort to help the airline companies and to promote air mail service. Activities were planned across the United States and the goal of the organizers was to get each citizen to mail or receive an air mail letter during the week-long celebration. Famous aviator Bessie Owen flew a bag of mail from Goleta to Ventucopa in honor of the campaign. Yeast tycoon, philanthropist and Santa Barbara mayor Max Fleischmann used the Santa Barbara airport for his private plane. This is a good shot of one of the hangars and the terminal. An aerial view of the airport and some of the slough in 1938. Circled are the two hangars and the intersection of Hollister and Fairview. Check out Goleta in 1938! A whole bunch of nothing but agriculture. In 1939 the Santa Barbara Chamber of Commerce recommended the site for a municipal airport should be the Goleta Slough. After much political wrangling, the real estate was secured along with federal grants to help with the cost. By 1941, the Army Corps of Engineers began the huge job of filling in the slough with dirt from Mescaltitlan Island. With the advent of World War II, the construction was placed on high priority. The Marines moved in and construction was going on 24 hours a day. In this photo of Goleta in 1943, the two hangars can be seen tucked off in the corner of the completed air base. They continued to be used by the airport after the war, and until just recently, when they were condemned. Tom Smothermon put this comparison together of the hangars in their heyday and today. If these two hangars could talk, they’d have a lot of stories to tell. They’ve seen a lot of changes in Goleta, and in aviation. From bi-planes to Lear jets, they have sat and watched quietly. If you look closely, different company logos can still be seen painted on the buildings. 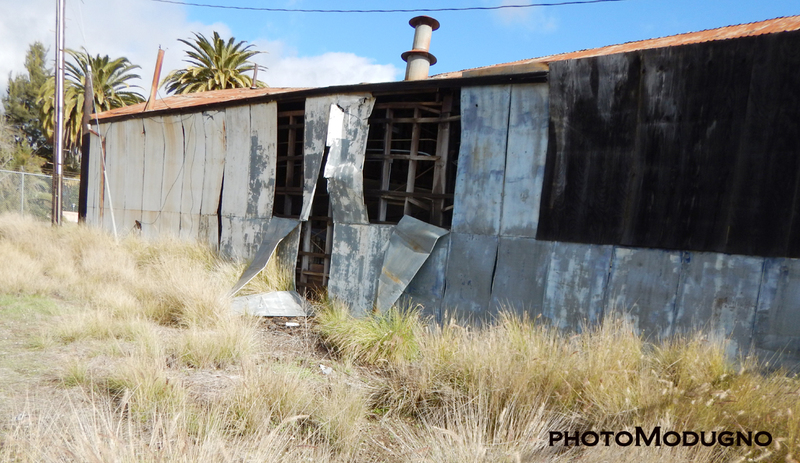 The old hangars are in a serious state of decay and if nothing is done, they will soon collapse. Seems like an ideal location for an aviation museum to us, especially since Santa Barbara and Goleta have played such a large part in the history of aviation. Much more than we can mention on this short page. Hopefully the powers that be will reconsider their plans for demolition. Justin Ruhge, Walker A. Tompkins, Edhat, SB Independent, Karen Ramsdell, the Urban Hikers, John Voss, Santa Barbara Municipal Airport, Wikipedia, Noozhawk, Casey Hart, Gary B. Coombs and Michael E. Ackerman, Santa Barbara Historical Museum and special thanks to Adam Lewis.